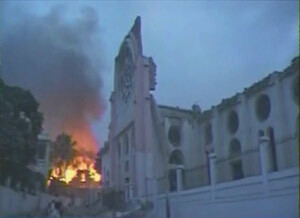 Fire rages in Port au Prince, Haiti, in the background of a destroyed cathedral. “The world is coming to an end!” screamed a Haitian school girl into a cellular phone after Tuesday’s earthquake that has shaken Port Au Prince, Haiti, to its foundations. The quake that brought more misery to the first free black republic in the New World, has also sent tremors to Kingston, Jamaica, Santiago, Cuba and Santo Domingo, the Dominican Republic which shares the island of Hispaniola with Haiti. You could excuse the girl for thinking this is something apocalyptic as prayers are pouring in: US President Barack Obama said his “thoughts and prayers” were with the people of Haiti and that he expected “an aggressive, coordinated [aid] effort by the US government”. Pope Benedict XVI has called for a generous response to the “tragic situation” in Haiti. Happily these two leading global personages have offered more than prayers and governments and businesses, including some in the Caribbean have offered tangible disaster response assistance. Since Toussaint L’Overture, Jean-Jacques Dessalines, Henri Christophe, and others secured Saint Domingue’s freedom from France and slavery in the 1791-1804 revolt, it has been one disaster after another for the people of Haiti, and grievous sins have been committed against them. In 1824, France demanded 150 million francs as reparations for slaveholders in exchange for recognition of Haiti’s independence. While the amount was reduced to 60 million in 1838, the debt was not amortized until the 1930s. Further, resistance to a free black state in its underbelly, by the United States, contributed to the country’s economic stagnation which reinforced a siege mentality ideal for the rise of local despots beholden to foreign benefactors. It makes it ironic the statement by US President Barack Obama that “We are just now seeing the extent of the damage” to Haiti, having seem images of the devastation of the earthquake. Historians say that Haiti’s winning its freedom was inspirational to the enslaved in neighbouring territories. Indeed, the current municipal organization that runs the affairs of the Jamaican capital, the Kingston and St Andrew Corporation (KSAC), had its genesis in a body to secure against the possibility of a repeat of the events in Saint Domingue and to police refugees from the tumultuous territory. In its socio-linguistic isolation from the rest of the Caribbean, Haiti fell under the rule of tyrants who terrorised its citizens and raped its treasury, making the people the poorest in the hemisphere. The result of the impoverishment is a denuded physical environment as people burn plants for charcoal, resultant flood prone hillsides, stories of people selling their blood and eating mud to survive and landless peasants living in stilted shacks built on spots occupied in the harbour. But worst of all is the violence that has been spawned by the despotic politics and which has led to a continuous exodus of Haitians from the country. Currently there are hundreds of United Nations peacekeepers in the country tenuously keeping the factions apart. And maybe in another ironic twist, the mission head who remained missing a day after the earthquake is close to the French Foreign Minister Bernard Kouchner, who, in reporting that the UN HQ had collapsed, is quoted as saying, “it would appear that all those who were in the building, including my friend Hedi Annabi… and all those who were with him and around him are dead”. Lying on an earthquake fault line and being along the main tracks of Atlantic hurricanes has only compounded the worries of Haiti. In 2008 alone it experienced four hurricanes or storms that with the flood prone topography combined to kill hundreds of people. 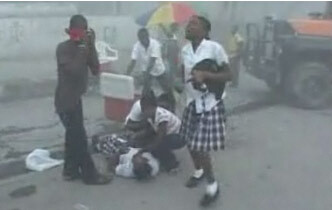 A school girl wails in Port au Prince over an injured colleague. It is good therefore, to see that at this time of disaster and human frailty, the response is more than platitudes and prayers, which is what the world has offered in loads over the years. “I expect to hear/read condemnatory declarations from some religious folk. Mostly though, I expect the religious flock to step forward and aid these brothers and sisters,” wrote a member of a Jamaican online forum in response to a post that zealots may ascribe the earthquake to supernatural events. The Jamaican Prime Minister, Bruce Golding, has already announced that his government will send a detachment of soldiers “after search and rescue teams have evaluated the physical environment to be stable” to assist in reconstruction efforts and the restoration of services. As well, arrangements are being made to coordinate other aid from the public. 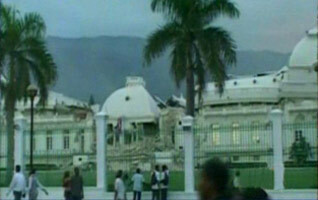 For the third time in its history the Presidential Palace is destroyed. In Barbados, it was learned that Prime Minister David Thompson had had an emergency meeting Wednesday morning to plan his country’s response. oc and his son Baby Doc Duvalier were now history as Port au Prince strives towards social democracy and free elections. For people like calypsonian David Rudder of Trinidad who sought penance for the region in his 1988 song, “Haiti”, help is not a moment too soon and there is no place for an apocalypse now. An excellent piece putting the Haitian situation in historical context. The religious finger-pointing has already begun, though. My daughter told me a taxi driver in Toronto told her that God was punishing Haiti. If that is true, why? How much more can the people of Haiti take. It is said the Lord does not give anyone more crosses than they can bear. The Lord seems to have a very positive view of the resilience of Haitians. I weep for you Haiti! !